Yuliya Tymoshenko was of course not allowed to stand, and it is impossible to judge the size of her sympathy vote, but it seems to have been a factor. Unless she gets out of prison, however, Arseniy Yatsenyuk, the leader of the Front for Change, the other main part of the not-particularly-united ‘United Opposition’ coalition, is now the assumed front runner to challenge Yanukovych in the 2015 presidential election – assuming it goes ahead. No doubt alongside Klichko, and both men are all too obviously already planning ahead. UDAR’s campaign this time seemed to peak too early. It was also unable to shake off the suspicion that it might ultimately ally with Regions. Nevertheless, UDAR did well because it is new. The 10.4% and 37 seats won by the Freedom party were the biggest surprise, however. The party likes to depict itself as a Le Pen-ist new ‘moderate’ new right party, but its ugly face is barely hidden. The party objected to the Gaitana, Ukraine’s 2012 singer for Eurovision this year, because she was black. Its slogan of ‘Ukraine for the Ukrainians’ isn’t really about immigration – Ukraine doesn’t have many immigrants. Rather it is code for the traditional cultural contest with Russia and the Russian language. This interesting study claims Ukraine has the highest number of ‘attitude radicals’ in Europe. But there were several contingent factors in the Freedom party’s success. One was differential turnout, which was 58% nationally, but higher in the west (67% in Lviv, 49% in Crimea), boosting support for the opposition. The last parliamentary election was in 2007 – before the global economic crisis that has boosted support for many similar populist far right parties elsewhere in Europe. The Freedom party harvested a classic protest vote, boosted by the withdrawal of the traditional ‘against all’ option from the ballot paper. It also benefited from the backlash against the Languages Law passed in July to raise the status of Russian, which has prompted big protests in western and central Ukraine – whether this was cynically intended by the authorities or not. So this being Ukraine, conspiracy theories also abound. The rise of the Freedom party divides and potentially discredits the opposition, which suits the authorities, who have covertly funded the party in the past – though its campaign this time looked a little threadbare. The fact that the economy is already in double-dip recession, with GDP falling in the last two quarters of 2012, also helps explain why the Communist vote in east Ukraine more than doubled, to 13.2% and 32 seats. Some commentators have welcomed the fact that Ukraine now has two relatively ideological parties on the left and right flanks, though there is no clear incentive for the other parties to follow suit. Some talk of a ‘1999 scenario’ in 2015, when the sitting President (Kuchma in 1999, Yanukovych now) builds up the Communists so as to have an easily defeatable opponent in the second round of the presidential vote. One group of people who are probably less happy are the sponsors of expensive ’political technology’ projects, which mostly flopped this time. 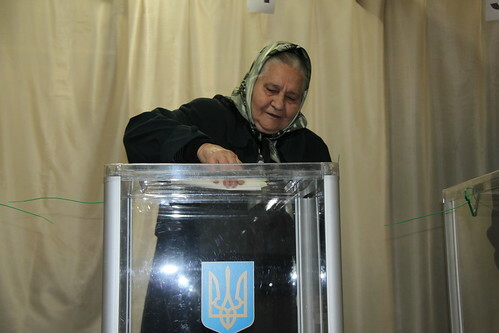 Despite a massive budget and a last-minute push to exaggerate its poll ratings, Forward Ukraine! won only 1.6%. Actually, finance was the problem. The party smelt of money and was too obviously a ‘personality’ project – no real party stood behind the party leader Nataliya Korolevska, who was a cut-price Tymoshenko clone, and her bizarre pairing with the footballer Andriy Shevchenko. It is good news, though, that Ukrainians are hard to fool. So, one or two cheers, if not three, for Ukrainian democracy showing some surprising signs of vitality. This does not contradict the OSCE’s judgement: they were factoring in the measures taken before the vote to make sure the playing field was hardly level. But it has levelled out a bit. Finally, Ukraine’s partners are less happy. The EU faces the dilemma of what to do with the frozen agreements. Russia is pressing hard for Ukraine to join the Customs Union, but if Ukraine seems to respond to the offer after the elections this will almost certainly be a bluff to try and lever the West. Still, everyone can’t be a winner. This piece was first published on the blog of the European Council for Foreign Relations and is reproduced with permission.